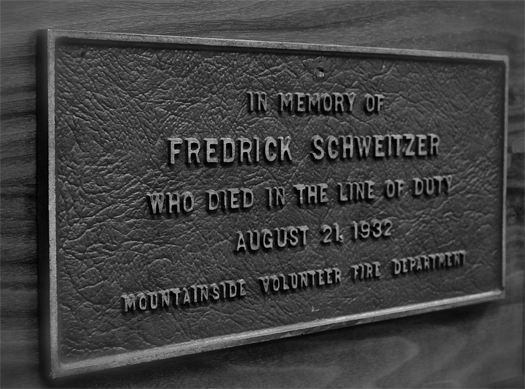 Fred Schweitzerdied in the line of duty in 1932. We remember those members of the Mountainside Fire Department who have gone before us, leaving in our hands the responsibilities which they had pledged themselves to perform for the benefit of their fellow townsmen. They had assumed their duties willfully and without thought of individual honor or gain, thinking only of the urgency of the need of their fellow man in time of danger. To all those who voluntarily served their community in the fire service, their efforts will not be forgotten.